I certainly picked a great day to do my first sprint event in years. 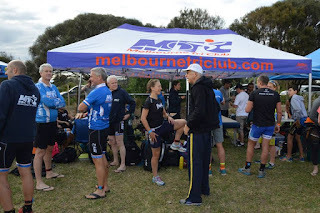 A group of old warriors from 80's triathlon chose to make their comebacks and race this event in their own wave, namely the Old Hands Triathlon group. They were some big names in their day and seeing them out there brought out some old faces and memories. 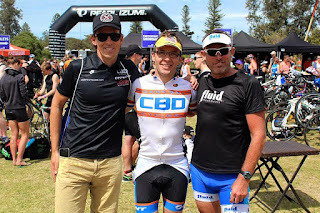 I racked my bike pre race, and across from me low and behold was one of my first ever bike sponsors Robin Tullett (Triathlete bike store) from back in 1998. Robbie was a great athlete himself back then and looked as fit as ever, which wasn't surprising as he has always kept himself in good nick. I got all my pre race duties done at our club tent, then found a quiet spot to don the wetsuit. Wasn't nervous at all and excited about getting it on come race time. So on schedule walked to the start line about 15mins prior to my age group start. I had a number of my athletes that weren't racing doing their session along the course, and i think they had the impression i would go well. I didn't want to make excuses so didn't try to talk their expectations down. I have never really excelled as a sprinter, my strength was long course and my race speed varied minimally from a Sprint to a 70.3. Got a great start considering my swimming has been a little amiss lately in the training pool. i tried to temper my effort over the first 200m, as i knew id pop if i went out at my usual pace. Found some feet and settled in behind a guy who was weaving through the remnants of the wave ahead with panache. i liked his style! Coming into the beach did a couple of duck dives and was on the sand. i heard our unofficial squad photographer Jan Dean call out some encouragement but didn't have the energy to acknowledge her as my heart was in my mouth. 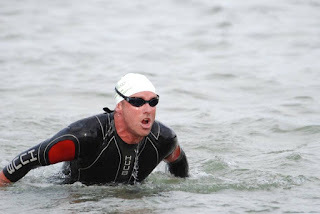 Think i was third out of the water in 45-49 and i knew there would be some stiff competition with alot of ex champions from back in the day turning up to do this event. I managed to compose myself enough for some trash talk, coz as i was running to my rack in T1, the leader in my age group Grant Gilbert was was a bit of a gun had managed to drop his goggles in front of me, having to run back to get them (must have been exe ;) ) i gave him a bit of a rev up by yelling there goes your lead..... he gave me nothing in return. Touche'! Onto the bike, clean mount and out of the saddle to get up to speed. 2laps of 10kms on the bike, and we had a slight cross-tail wind helping on the ways out and the opposite on the return. My wave was 15mins in so the road was pretty clear on lap one. I gunned it for about 5km then settled a bit and brought up the cadence as i knew there would be headwind to come. I rode solid, the little bike tweak pre race i did nearly had me dialed in, but was a bit long in the top tube on the into the wind sections; note to self for the next race. I managed to not get passed on the bike and alot of the second lap i was yelling rider back and having the squeeze past 2-3riders wide. Gained some real energy from the crowd near the end of each lap which was nice and was clean coming into T2 with no hiccups on the dismount. Running in with my bike i tried to make some places and snuck past a few lads. Some smartass from over the fence yelled out "you used to be faster than this" DRRR i thought and got back to the race. After a little bit of a wrestle with the runners i was out and onto the run. Now some might say i am not the prettiest runner, especially when I'm on the rivet and gasping for air. Today my lack of style was amplified by a few extra kilos and a small lack of condition. For the first 2kms i felt like i was running on the spot with no forward drive at all. I kept waiting to hear runners come storming past me, but in reality only one did as i was surrounded by guys my age or the age group below. So i was holding my own. Finally i got into my strides at the 2.5kms turnaround. My strides started to lengthen a bit and i felt a touch more relaxed. I saw fellow squad coach Aaron Keeffe about 100m back at the turn so that was what i needed to put the foot down. With about 1.5kms to go i was blowing hard and i was seeing glimpses over of my shoulder of a black figure gaining from about 50m back. i have never been a kicker at the end as i am usually sitting right on my terminal speed so i just nailed myself from 1.5kms not knowing if he was in my age group. Gave it everything but he got me with about 100m to go, and thankfully he was not in my age group. I am never one to start a watch for an event, so I worked out coming up the chute that id done around a 1:02hrs based on the finishing clock, which was confirmed post race. In the end i was pretty chuffed with that and finished 4th in age, not bad for someone who can't sprint. I wasn't a patch on the squad athletes i coach though, we came away with 2wins, 3seconds, 2thirds and a number of top 5's on the day. We also performed very well at some other events being held simultaneously too. It was great to get out there and mix it up, i love a good hitout and i cant wait for the next one.